Yang Mao-Lin rose in the art world during Taiwan’s turbulent 1980s. In his early work, he broke through taboos and challenged political and social authority, thus revealing an intense critical attitude. Brimming with tension, his exciting painting style and sensational visual imagery subtly echoed social and political transitions as Taiwan abandoned martial law in the 1980s. In the post-martial law period of the 1990s, as globalization gradually took shape and ties between internationalism and nativism grew more complex, Yang’s work shifted from political activism to historical and cultural retrospection. He appropriated the phrase “MADE IN TAIWAN” and used it as a title to broadly explore the expressive and critical potential of art forms and ideas from the perspectives of Taiwanese politics, history and culture. “MADE IN TAIWAN” has been Taiwan’s international trademark and symbol of unique qualities for many years. Yang Mao-Lin appropriated this symbol to make a statement about Taiwan’s position and cultural identity, and to construct a system of icons that highlight subjectivity in Taiwanese art. 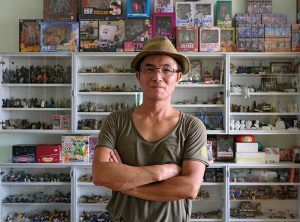 In around 2000, he broadened his artistic vision by making three-dimensional artwork while continuing to explore topics related to Taiwanese culture. Also at this time, he started commenting on connections between local and imported culture by using a style adopted from comics and concepts of cultural hybridity. Essentially, he accomplished this with unexpected juxtapositions, and these unique and visually rich compositions mitigate the strong/weak power relations that arise when cultures collide, thus making the intention behind “MADE IN TAIWAN” all the more evident.